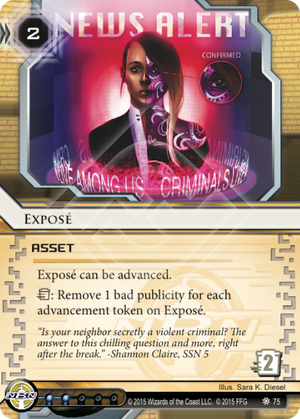 trash: Remove 1 bad publicity for each advancement token on Exposé. Are there CYBER-CRIMINALS in your neighborhood? Walking among us? Perhaps even in your HOME? The marks are still fresh from the infamous Levy University scandal, where a seemingly unobtrusive professor was outed as a cyber-terrorist! In tonights Exposé, we'll be covering the notorious Muertos Gang populating the Underway, a cabal of secret extortionists, thugs and public despoilers who stop at nothing to control the helpless citizens of SanSan! What's worse, they often live double lives, hiding their gang activities behind a veneer of legitimate business! Our exclusive NBN sources are with you, keeping people informed and safe about these DANGEROUS criminals who lurk in our midst! Please consider donating a small sum to help keep these public service announcements alive! Though it costs us, we at NBN are committed to the expenditure to keep the people in the know! Don't worry about what you may have heard, or what you may have seen -- NBN is here for YOU. disclaimer: nbn takes no responsibility for the actions undertaken on the part, at the behest, or in lieu of other multinational entities with regard to publicity management or other such activity with relation to, but not limited when considering the scope thereof, the use of illegal intrusion countermeasures electronics (ice), testing or experimentation of asset retrieval bioroids, forced, necessary or involuntary clone retirement, the alleged hire of mercenary assets or bounty hunters, illicit weapons manufacturing and sales, environmentally unsound mining practices, allegedly "hostile" company mergers and acquisitions, or property redevelopment. This card makes Valencia cry. Aside from that it has huge potential to actually make BP removal a thing. I think Weyland will like it the most because they can score hostile takeovers / geothermal fracking, Rez checkpoints, and then bait the runner into running followed by removing w/e amount of bad pub that you prepared to remove. It is also a great mushin target.